The Well Multi-Cultural Resource Centre – A friendly, drop-in service for the Multi-Cultural communities of SE Glasgow. We’ve just come to the end of a very busy week in The Well. On top of the routine information and advice work we squeezed in the first of our 25th anniversary celebrations – our Chai & Chat group organised and hosted an afternoon tea party for the women who attend our various activities and they also invited the women from a neighbouring project – “The Space”. The Well enjoyed the first of a few planned celebrations yesterday to recognise its 25-year anniversary. This first event focused particularly on the work The Well does with women and children. 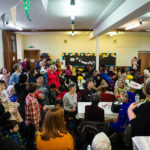 The Well supports women from various ethnic minority groups in the Govanhill area by tackling some of the issues that face them, from social isolation to poor English skills. 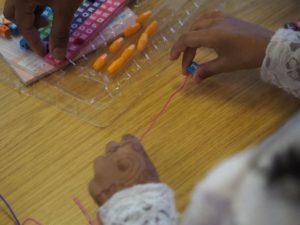 One-to-one relational support is offered as well as a range of group activities including female only English and IT classes, ‘Bubbles’ mother and toddler group and ‘Chai and Chat’ a group of women from varying backgrounds and cultures who meet regularly to get to know other women in the area. 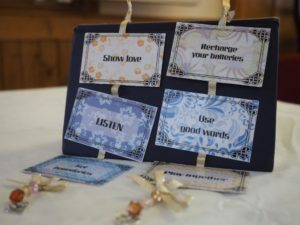 It was the Chai and Chat group that inspired the idea for yesterday’s event: an expanded Chai and Chat representing all cultures present and open to women who have used The Well’s services and their children, along with some of The Well’s supporters ranging from funders to church representat ives. 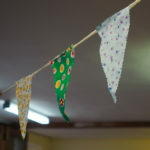 The event was an explosion of colour, culture and cake! Over 120 women came along to the event that was held in Govanhill Free Church, and approximately 30 children. The Well’s dedicated volunteers were on hand to play with the children and welcome people and serve the fabulous food. Some of the women who regularly come along to the Chai and Chat group took the lead under Penny MacLeod’s (Women’s Development Worker) direction in decorating the room for the event and preparing the delicious food that included delicacies such as: Romanian Walnut Cake – made by the women of The Space and Pakora made by two Chai & Chat women. 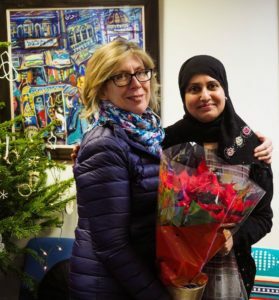 Manager of The Well, Rhoda Yarmahmoudi, thanked everyone for coming to celebrate The Well’s 25th anniversary and Penny MacLeod for organising the event. Everyone sang ‘Happy Birthday’ to The Well when a special commemorative cake was brought out. 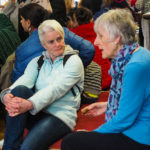 The Next Day we were delighted to welcome members of the Go For It Team along with the Moderator of the Church of Scotl and – The Right Rev Susan Brown. Go For It has helped to fund The Well for 5 years, and we are extremely grateful for the huge difference their contribution has made to The Well, and were delighted when they asked if they could bring the Moderator to visit us on Wednesday. What a great time we had with them, including a discussion about John 4. One of our long term service users, and most recently recruited Board Member – Lolo, told them of the massive difference The Well has made to her life over many years, including her somewhat unusual request to source a memorial stone that she could take to Africa in memory of her mum. Lolo went on to say there are other advice centres and she had been to many, but kept coming back to The Well due to the friendly atmosphere – she always sensed that The Well was about relationship and this is what made it stand out from everywhere else. Posted byRhoda April 1, 2019 April 1, 2019 Posted inLife in The WellLeave a comment on What a week! For the last quarter of a century, The Well Multi-Cultural Resource Centre (The Well) has been providing a high quality information and advice service for ethnic minority communities in Govanhill and surrounding areas containing datazones among the most deprived 5% in Scotland (Scottish Index of Multiple Deprivation). 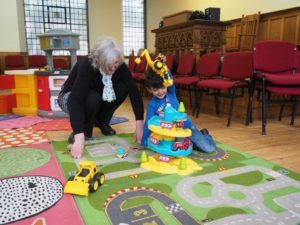 The need for this service was exposed due to a ‘needs survey’ carried out by the Church of Scotland in the early 1990s as it wished to serve the growing Pakistani community in its parish in the best possible way. d women with a wide range of issues from income deprivation and English language difficulties to social isolation and integration struggles. Twenty five years on, The Well still draws a flow of local people, many of whom have come to love the centre and its hospitality. Last year The Well had over 6000 visitors for one-to-one advice consultations. 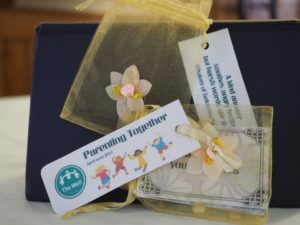 Over the years, services have expanded to include group activities from English and IT classes to a women’s Chai and Chat group and a mother and toddler group. These activities have proven to be invaluable in building people’s social networks, confidence and skills, as well as integrating a community that now has over 50 spoken languages! For our 25th anniversary we are asking people to consider pledging £25 to allow us to continue this vital work. Over the course of this year, there will be several events to celebrate The Well’s 25 anniversary. Keep an eye on www.thewell.org.uk or follow The Well on Facebook. Posted byRhoda March 28, 2019 March 28, 2019 Posted inLife in The WellLeave a comment on Silver Anniversary! We’re just about to turn 25!! 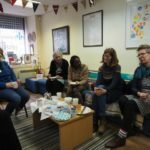 Our hope is to the make the next year a year of mini events that will celebrate our Silver Anniversary starting with a Chai & Chat celebration with local women from all backgrounds on the 26th March. Finally the updated newsletter from The Well – read about our recent experiences of Good, Bad and some really Ugly! Last week I accompanied a young woman to an appointment. We were early and so decided to have an ice-cream. She was so happy, and told me that she’d not had an ice-cream ‘outside’ in five years. She’d been little more than a servant in her marital home, but things have changed and now she is able to enjoy being outside! There you go it’s just another week in The Well . . . if there’s such a thing! But we’ve got a real and urgent problem! These stories can only happen because of our dedicated team of wonderful volunteers, but we don’t have enough volunteers to cover all the shifts at the minute. Recently three of our volunteers moved away, or have family commitments and are no longer available, so we’ve lost cover for SIX shifts! Whilst the rest of the team has been willing to fill in the gaps as they can, that is not sustainable and for the first time in over 24 years we are looking at having to temporarily reduce the number of advice sessions, at the same time as the needs are growing. Please pray about this and ask God to send us the right volunteers to fill in the gaps. But it’s not just in the advice part that we’re struggling:-( Bubbles – our mother and toddler group – currently has no volunteers to work with Penny in the new session. No volunteers, means no Bubbles! The priority for Bubbles is the relationships that are built with the women and we know from the comments they make, that this is a vital service and part of our work – so another urgent prayer request for you! Please get in touch if you want more information, or feel this might be for you! 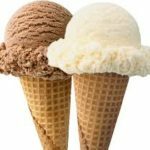 Posted byRhoda August 9, 2018 Posted inLife in The WellLeave a comment on I’ll buy you a coffee . 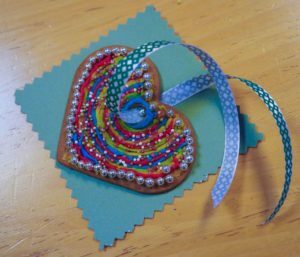 . .
At our final Chai & Chat Session for this year, after the women had spent time decorating Christmas Ginger Cookies – they looked amazing! We wanted to thank the volunteers who make the Chai & Chat group happen, and this year we had a special thanks to Shanaz* for her help in the group – teaching them how to make teddybears! A first for her to take the lead, and she did exceptionally well! After the formalities were all over we enjoyed the various snacks the women had brought – oh the advantage of working cross-culturally, such delicious homemade food and snacks! “You make Christmas about the people.” I’ve been thinking about that, Christmas is about the people as Penny so aptly told the women, but I’ve also been reflecting and thinking on how the most important person of the Christmas story and actually who ever lived, makes it possible for The Well to be all about people – not just at Christmas time, but right throughout the year. For the past year we have benefited from Sarah’s help with our funding applications. Sarah fitted in quickly and easily to the team, and we certainly benefitted from her youthful enthusiasm, confidence and marketing experience. So we were disappointed when Sarah got a new job, which meant she would no longer have the time to commit to The Well. We are thrilled for her, knowing that she was looking for a new challenge in her professional life, but we do feel her lose very keenly! It does mean that we are once again having to look at how we manage the fundraising side of the work. Penny is able to commit one day a week, but we do need more than that, and just now we are considering a team approach – perhaps a group of volunteers who would be able to help out a couple of hours per week or month? The schools in Glasgow go back tomorrow and or the first Monday in a very long time, The Well is quiet – I guess a lot of people are getting the last minute things sorted. Various folks are also getting ready to restart all of our activities. Chai & Chat hope to start on Tuesday 22nd August in The Well. Bubbles for women and children will start on Thursday 24th August in Govanhill Free Church. These activities all provide very important skills and opportunities for the folks who come, with virtually everyone seeing an increase in their confidence as a result of coming along. The relationships that are built in these groups are very special, with some becoming genuine friendships that last for years. Recently we were given funding from St Margaret’s Scottish Episcopal Church in Newlands to run a parenting class for some of our Mums. Since April we have been meeting every Wednesday morning in Govanhill Free Church, with a group of mums primarily from a Pakistani background, but also one Romanian mum was referred to us from The Space, a local agency that we share a common ethos with. We have covered such subjects as “looking after yourself” “the importance of words” “boundaries” “listening” “play” and much more. It was lovely every week to have Gail and Ailsa look after the children, and Shaida doing both the hospitality and translation as required. I’m pretty sure that the children’s favourite thing was the messy play every week! The mums thoroughly enjoyed our sessions and we had a special time today, encouraging them to build good memories with their children. Special thanks to Gail for making these lovely wee momemtos for each mum. Next week our volunteers will be watching the film “I, Daniel Blake” as part of their training for the work in The Well. If you’ve not seen it, then I encourage you to watch it. The harsh reality of sanctions and dealing with a system, which by its nature forces people into poverty, with little chance of escape is dealt with very powerfully in the film. Kirsty has been working with us for the past couple of months and as she won’t be here next Friday, she watched it herself with her family – you can read what she thought of it in our June newsletter. As Kirsty says it should be compulsory viewing for everyone!